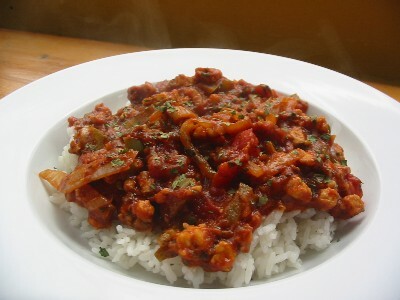 Here’s a super quick & tasty vegetarian AND low sodium one dish meal. Although I’ve paired it with rice, this also tastes great spooned over baked potatoes or in salt free buns as an alternative to sloppy joes. Or, over pasta, egg noodles, couscous.. The list goes on…. Heat oil in a saute pan over medium-high. Add tempeh, onion, bell pepper and garlic and cook, stirring, 5 minutes. Add remaining ingredients, reduce heat to medium-low, and cook another 15 minutes, stirring frequently. Remove from heat and spoon tempeh over the cooked rice. Serve immediately, garnished with additional cilantro if desired. I made this dish for my family tonight, and I must say it is the BEST dish I have ever made. Everyone loved its uniqueness! It is full of flavor and absolutely delicious! Thank you so much for sharing! Your website has been so helpful in preparing low sodium dishes since my recent Meneire’s diagnosis, so thank you! You are so gifted.